Welcome back to sefirah, folks! I’ll be your host (one of them, anyway) for the next few weeks, while we put to the test the Jewish Music world’s latest attempts to make us forget that we aren’t supposed to be listening to music between Pesach and Lag BaOmer (or between Rosh Chodesh Iyar and Shavuos—I don’t discriminate). As a quick refresher, here are the rules for the producers. Rule #1: No instruments allowed. Rule #2: If Rule #1 makes you sad, fake it. Rule #3: If you can’t/don’t feel like faking it, make sure you have enough background singers so it doesn’t make a difference. This year’s first entry, A Kumzitz in the Rain 2 by Doni Gross and company, falls squarely into Rule #3 territory. Like Volume 1 (released in 2011), the album is all slow songs, and feature soloists accompanied by a robust background choir. The soloists range from the well-known (Ari Goldwag and Shlomo Simcha) to up-and-coming (Moishey Ney) to child-soloists-all-grown-up (Yosef Schick), and the songs are the same mix of relatively-new, old-school, and wow-I-thought-I-was-the-only-one-who-remembered-that-song as last time. In a nutshell, everything that worked on the last album is back for this go-round. It sounds like Doni was able to locate a couple bass singers for the choir (which seemed to be missing from the last album), which really rounds out the sound. It also looks like this album contains recordings that were left on the cutting-room floor after Volume 1 was finished, because a few of the child soloists’ names are noted with “(2011)” after their names in the liner notes. Arrangements were handled by Doni Gross and Shumi Zelmanovitz. Track 1, “Torah Hakdosha” (composed by R’ Hillel Palai, originally on Ma’aminim by MBD): The album starts off with a recent classic. This track really shows off the vocal arrangements with will accompany us through the album, and really shows off the low-end vocal prowess of whoever is the new bass (or deep baritone) in the backup choir. Solo duties are handled by Yosef Schick, whom you may remember from his work on the first Shalsheles Junior album in 2006. Track 2, “Ein Aroch” (composed by Baruch Levine, originally on DoviDovid): Remember the year 2000? If you can imagine, back then Baruch Levine was still “only” a composer (and the kid from Dveykus’ “Hamalach”) and was giving away gems like this to other singers. Eventually Baruch featured this song on his second album, in the medley of songs he had let other people make famous. This time around, it is sung by Baruch’s fellow Torontonian Shlomo Simcha (still one of the best voices in Jewish music), Binyomin Scharf, and Asher Schick. Track 3, “Mehaira” (composed by Mendy Fisch, originally on Nagila V’Nismicha by Benny Friedman): By my calculation, this is the most recent song on the album, from Benny Friedman’s 2011 wedding compilation album. As to be expected at this point on a Benny remix, Ari Goldwag is the featured soloist on this song, joined by child solo Meir Rikowsky. Track 4, “Tov Lehodos” (composed by Yo Aisenstark, originally on Precious Tears by the Shalheves Boys Choir): Hey, Doni: the nineties called, they want their anthem back. Can’t get much more classic than “Tov Lehodos”, right? With apologies to the nice people who wrote the copy for the liner notes, this song predates its Avromie Flam incarnation by five years or so. This time around we are treated to solos from a capella veteran Tzvi Silberstein, child star Binyomin Scharf, and the one and only Moishey Ney. Track 5, “Shalsheles Medley” (composed by Yitzchok Rosenthal): This track is a medley of Shalsheles songs: “Heyma” from Shalsheles Junior 2, “Shir Hamaalos” from Shalsheles IV, a few bars of the iconic intro to “Esa Einai”, and “Ekrah” from the original Shalsheles. The soloists (Shloime Kaufman, Akiva Elbogen, and Asher Schick) blend together perfectly, highlighting the skill of the arrangers, the singers, and the engineers in the studio. This track is perfect in its simplicity. Track 6, “Chamol” (composed by R’ Akiva Homnick, featured on One Day at a Time by Shloime Dachs): In my shul, I usually daven Mincha from the amud on Yom Kippur, and I use this song in chazaras hashatz—assuming the chazzanim for Shacharis and Mussaf haven’t used it first, of course. Michoel Pruzansky delivers a stirring rendition of R’ Akiva Homnick’s timeless classic. Track 7, “V’chol Mi” (composed by Doni Gross): You knew the Schwebel family would show up sooner or later, right? Rivie and Avromie are joined by a 2011-vintage recording of Yehuda Gross in this beautiful original paean to the “oskim b’tzarchei tzibbur”, the people who dedicate themselves to the community. Track 8, “Reach Out” (originally on JEP Sings Reach Out): Last time around, Doni Gross reached into the archives and pulled off a stunning rendition of the Abie Rotenberg classic “Ahavas Yisroel” from Marvelous Middos Machine 3. This time Doni goes even deeper into the annals of Jewish music and came up with the title song of the first JEP LP from the 1970s. This song, sung by a bunch of people with the last name “Gross” and Binyomin Scharf, is an absolute winner, if not quite the tear-jerker that “Ahavas Yisroel” was. Track 9, “Im Eshkachech” (composed by R’ Mordechai Twersky, originally on Lev Tahor 2): In this tribute to the gold standard of Jewish a capella, Doni and Co. remix Lev Tahor’s greatest slow song from their instrumental albums and give it the full a capella treatment. As Doni says in the liner notes, “We were asking, ‘What would LT do?” Translation: all Jewish a capella albums try to be Lev Tahor. Track 10, “Barditchever Nigun” (composed by R’ Levi Yitzchok of Barditchev, featured on Nishmas by Yehuda Green): The album finishes with a chassidishe nigun from Yehuda Green’s first album. Fun fact: Did you know that the Barditchever did not actually write the tefillah Gott fun Avraham? It’s actually from siddurim that predate him. 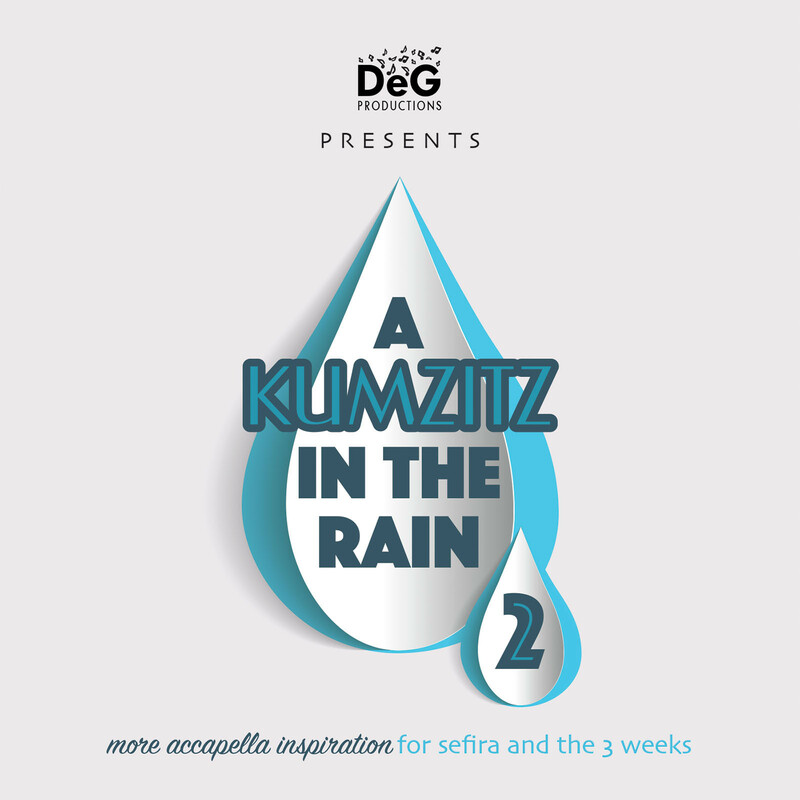 Here’s the thing: I would never want to go to an actual kumzitz in the rain. I would at least require the benefit of a gazebo or something. Thankfully, we don’t have to get wet to enjoy either of these sefirah-style masterpieces. Yosef Schick was also a prominent soloist in the Miami Boys Choir, and appeared on the albums Revach, Moshiach and Around the Campfire.